Getting Started with Xbar- Help is always available and ready! In Microsoft Outlook, click an email. 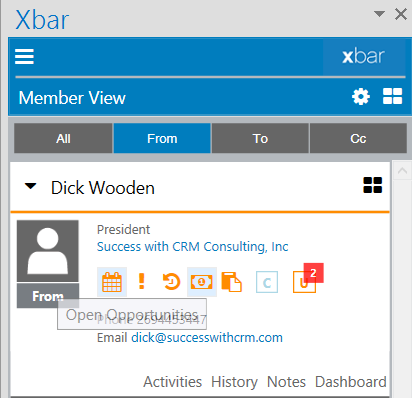 A Member card for everyone listed on that email appears in the Xbar pane. A Member is anyone in the To, From, or CC fields in a Microsoft Outlook email. If a Member is not already in the CRM database as a User, Contact, or Lead, only their name and email address appears in the Member card. (3 horizontal lines) Click to open the Global menu and access Global Search, Search Accounts, Search Contacts, What's New, Settings, and this help file. Click again to return to the Member view. (House) Click to go to the Member page. (Chevron) Click to close the current screen and return to the Home page. (Up arrow) Click to expand a panel. (Down arrow) Click to collapse a panel. (Square) This is the Ask icon. Click to insert new information and manage People, Activities, Support, and the Sales pipeline. For more information, see the Ask Icon section under Getting Work Done. (Pencil) When this icon is visible, click to edit. (Square with arrow) Click to open the Web or Windows Client. Enter a Client Url on the Xbar logon screen to enable this icon to open the Web Client. If this field is left blank and the Windows Client is installed on your machine, clicking the icon opens the Windows Client by default. In the Microsoft Outlook Menu bar, click Xbar. From here you can hide/show the Xbar pane, and add a Note. 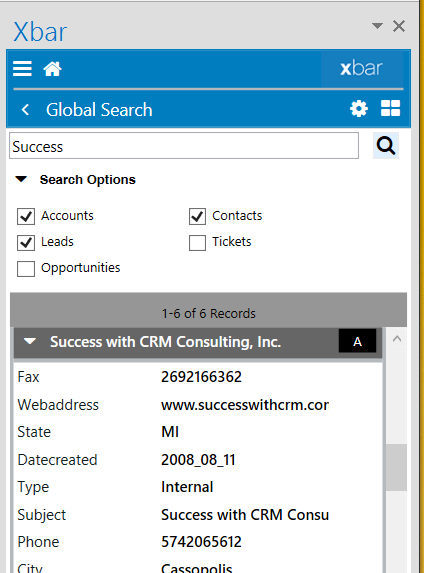 Click Global Search to search in the CRM database for Accounts, Contacts, Leads, Tickets, and Opportunities. Type in your search term, select the check box for the record types to include in the search, and then click the magnifying glass icon. There are no restrictions on the Search field. Use the scroll bar to see all of the Member records returned by your search. Click Search Accounts or Search Contacts to search by Account only or by Contact only. Type in your search term and then click Search. You can filter your search by field and by operator (Contains, Starts with). Click Server Configuration to see your username and password, and the URLs that connect you to the CRM database. Click Common Settings to change the language used in Xbar. The default languages are English, French, German, Italian, and Russian. Your installation may have more options. 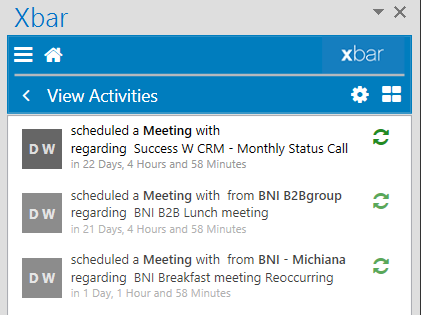 The cards for Members listed on an email selected in Microsoft Outlook are filtered in Xbar by All, From, and To. Expand the Default email filter options to select which filter group you want to see first. The other two groups are available by clicking on a tab. Use the Members to display box to limit the number of Member cards that show when you first click on an email. The maximum is 20 because displaying a large number of Member cards will slow down performance. Use Members "Load More" adds to specify how many more Member cards to add each time you click Load More. The maximum is 20 because displaying a large number of Member cards will slow down performance. Member cards: show a snapshot of what's important for you to know about each Member - the information you need right now. Totems: are the images on the Member card. When a totem is orange, click to jump to additional information about this Member. (Current Activities) Lists all your pending activities that include this member for the next 30 days. (Exclamation point) Lists all past due activities that included this member. (Counterclockwise arrow) Lists a history of activities that included this member in the last 30 days. (Currency icon) See a list of open Opportunities for this Account. When the list opens, click the blue underlined text to open Edit Opportunity Details. (clipboard) See a list of open Tickets for this Account. When the list opens, click the blue underlined text to open Edit Ticket Details. (C in a box) See a list of duplicate Contacts for this Member and select the record you want to use. A red number superimposed on the icon shows the number of duplicates listed. 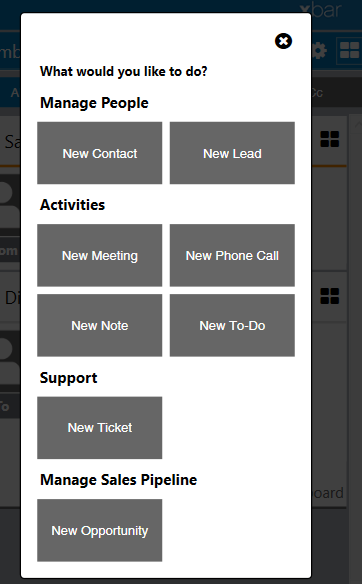 (U in a box) Shows when the Member is a CRM User. (L in a box) See a list of duplicate Leads for this Member and select the record you want to use. A red number superimposed on the icon shows the number of duplicates listed. Click Activities to expand a list of all of your activities current, future, and past due. From this list you can complete an activity or click the bold text to get more information. Click Notes to expand a list of existing notes and type in new notes. Click Dashboard to expand a visual summary of the potential revenue possible for this Member, any open Opportunities, and any open Tickets. Create new Activities, such as meetings, phone calls, to-dos and add notes. Note: If the Member is not already in the CRM database, the options will be new Contact or Lead. Caution! : Save your entry before clicking on another email or information you entered or updated will be lost. Summary Views: contain widgets for working with Activities, Opportunities, Tickets, Contacts, and Attachments. When you want more detailed information about a Member, click the Member name or the Account name to open a Summary view. The widgets available will depend on whether the summary view is opened from a Contact, User, Lead, or Account. 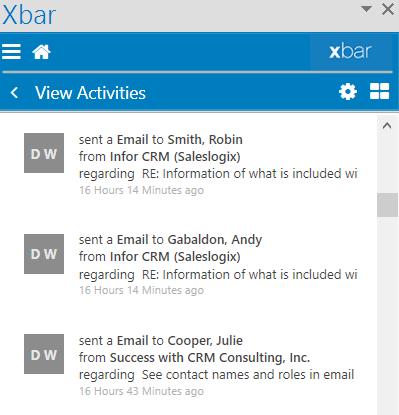 Add Attachments: Drag and drop to the Xbar Summary View Attachments Widgets. You can drag and drop email and attachments from Microsoft Outlook, as well as records from your desktop. 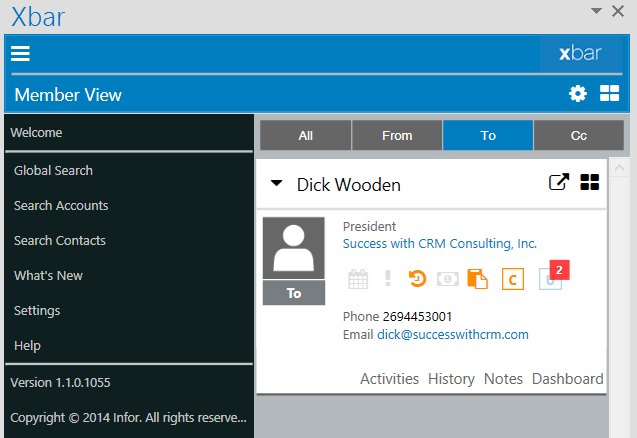 What if your CRM could move into your Outlook?